Both Lamme and Olex received dogs last September from the Ventura County chapter of Pets for Vets, now called the Military Animal Project. The organization rescues dogs from shelters and trains them to help veterans, reservists and even active-duty members of the military if they can prove they won’t deploy for 12 months. A fundraiser for the group is set for Thursday. In 2012, the two Marines served in the 3rd ANGLICO unit, an Air Naval Gunfire Liaison Company. They were deployed to Afghanistan at different times and reconnected at Olex’s birthday and welcome home party in 2016. They decided to become roommates last year. Lamme, a pre-med student, learned about Pets for Vets from Olex, 25, an exercise science major at California Lutheran University. Olex had spotted the organization at a college fair on the Moorpark College campus while he was taking an extra credit class. Bob Horrell, the director of training for Military Animal Project and a veteran himself, was there with a dog in training. Olex recalls that as soon as he encountered Horrell and the dog, he felt his tension dissipate. He signed up for a dog on the spot. “I would get inside my own head, and I knew I needed something to keep my mind busy all the time,” Olex said. Then he told Lamme about the organization. Lamme remembered how calming a dog overseas was, among all the turmoil there. “While everything was blowing up around us and everything was going to hell, there was still this loyal, loving dog that didn’t really care or judge you for the things you had done,” Lamme said. Olex got together with trainers Laurette Chapman and Horrell and explained he needed a dog that would enjoy hikes, trail running and fishing, as well as just relaxing at home. He had returned stateside with great difficulty being alone. The trainers found Kaia first, then Duke. Horrell said he knew Duke had the temperament to help Lamme with his nightmares. Chapman said Kaia was spry and active, fitting Olex’s needs. Chapman said it takes six to eight weeks on average to train the shelter dogs. This situation was unique in that the two dogs had to train together, given that they would be living together. Chapman and Horrell got together once a week with the dogs. To help with bonding, the vets are instructed to wear a T-shirt throughout the day, sleep in it, then mail it to the trainers. Olex said the connection with Kaia was not immediate, but he felt they were a lot alike. The turning point for them was when he put Kaia in the bed of his truck to go on a hunting trip and she put her paws on his shoulders and pulled him in for a hug. “In that instant, the relationship took a turn,” Olex said. Chapman believes the organization saves lives — of both the dog and the combat veteran. “We make a lifetime match for the dog and the veteran,” Horrell said. “If something happens to the veteran, we’ll take the dog back. If something happens to the dog — say he gets cancer — we’ll get the veteran another dog if they want it. We stay involved. For Olex especially, the dog has been a vital addition to his life. 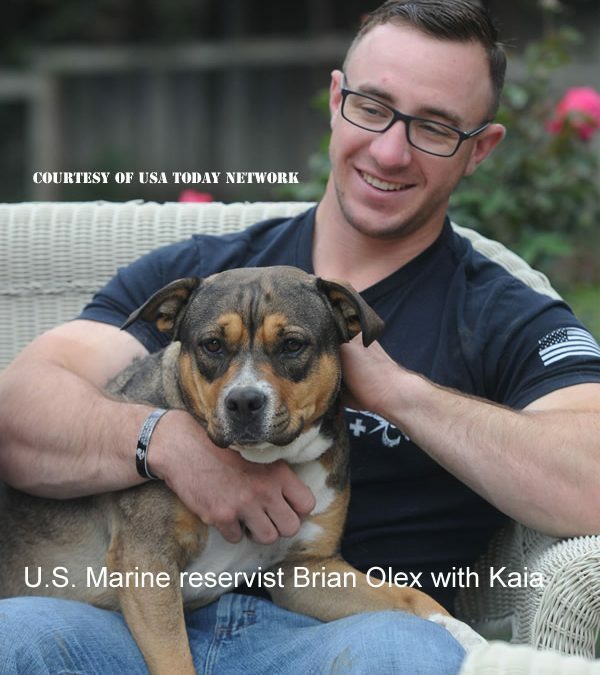 “Every day I get up, Kaia gives me a purpose,” Olex said. Agoura Hills resident Stephanie Clark, a comedian and an animal lover, began working with the organization three years ago. On Thursday, she and her husband, Tom, will host their second comedy show at the Elks Lodge in Thousand Oaks to raise money for the organization. While the admission is free, donations are welcome. The first year, the couple raised more than $2,000.